When you’re a political blogger, you never know what you’re going to get (unless it’s an attempted censure motion by the Opposition in Question Time, of course). There are good days – some juicy bit of policy to pick apart, strategy to analyse, election campaigns to follow. There are frustrating days – when all you have to work with is the same old message. And there are dead days. But on some days, it just doesn’t do to get out of bed. It might surprise you to know that Gillard launched the National Disability Insurance Scheme today, committing $8 billion and commencing building for the initial sites a year ahead of the Productivity Commission. The NDIS was supposedly bipartisan, yet now the Coalition is backing away from it, describing it in ‘aspirational’ terms and trying to point the finger at the government as somehow being at fault for going ahead with it. Substantial policy stuff, the NDIS is the kind of program that has been needed for decades, and hundreds of people have worked tirelessly to lobby successive governments on the matter. For this to finally be happening – funds committed, legislation passed – is a real victory for disabled people, their relatives and their carers. And if you want to find out about it, you have to wait until the bottom of the half hour on the news channels – because, apparently, there are much more important things to discuss. Because, apparently, political scandal, hypocrisy and the demonstrated contempt of our politicians for both the political process and their representatives rates higher in media priorities than letting vulnerable sectors of society know they will be able to access help they desperately need. First, there’s the ongoing Craig Thomson saga. The embattled Member for Dobell remains firmly in the Opposition’s sights, despite never having a single charge levelled against him, either civil or criminal. There’s been a Fair Work Australia investigation into the Health Services Union, with which Thomson was involved before entering Parliament. Nothing has come of it to date. FWA found it was probable that the union criminally misused member funds. The Australian Federal Police called for a proper brief. To date, they have not received one. Nonetheless, the Opposition were relentless. Thomson should resign! Thomson is tainted! The PM is clinging to power through a corrupt vote! This government is illegitimate! Et cetera. Either Abbott employs a team of super-psychics, who can discover dirt that no one else in the country can find, or this is simply the same grandiose political manoeuvring that’s led him to call for an election on almost a daily basis since the Coalition’s loss in 2010. Either way, he kept at it, and finally got a victory. The government was firmly behind Thomson and firmly on message. He’s entitled to the presumption of innocence. There are no grounds to remove him. We support him. Which is exactly what they should have done. But then yesterday, Prime Minister Julia Gillard announced that Thomson had been expelled from Labor Caucus, and would move to the cross-benches. To make matters worse, she went on to say that Speaker Peter Slipper, who stood aside when allegations of fraud were made against him by a former staffer, would continue to be out of the Speaker’s chair until civil proceedings from that same staffer were resolved. It was another about-face; right up until the day before the government staunchly defended Slipper’s right to return to the Speaker’s chair if he was not facing criminal charges, while the Opposition called for him at least to stay out of the job until the civil matter was resolved, and preferably resign altogether. In both cases, she justified the action as stemming from a public perception of a shadow over the Parliament. In other words, it looked bad to keep supporting them. It’s a big call, but this is very probably the weakest thing Gillard’s done since becoming Prime Minister. She allowed herself to be stampeded by an Opposition led by someone Independent MP Tony Windsor describes as ‘a rabid dog’, and did exactly what he’d been demanding. Maybe she thought this would defuse the issue. With Thomson out of the Caucus, maybe Abbott would have no talking points. If so, it was a shocking misjudgment. Having gained ground on the Thomson issue, Abbott immediately upped the stakes. It’s not good enough to have Thomson out of the caucus, he argued. His vote shouldn’t be counted at all – it was ‘tainted’, and Gillard would rely on that corrupt vote, rendering the entire government illegitimate. The only way out of this situation was – you guessed it – an election. ‘There is nothing wrong with our country that a change of government can’t fix,’ he said today at yet another media conference on the evils of the carbon price and the mining tax. Of course, he’s not going to attempt a no confidence motion, because he knows he won’t win. Thomson would vote with the government, as would Bandt. Wilkie’s a question mark, but self-interest alone may lead him to support the government (given the Coalition’s oft-repeated dedication to tearing him out of his seat at the next election). The crucial votes, then, are those of Tony Windsor and Rob Oakeshott – and neither of them support Abbott’s policies. The likely result, then, is a tie, which would be resolved in the negative by Acting Speaker Anna Burke, Labor MP for Chisholm. But Abbott doesn’t need to bring a no confidence motion. He just needs to keep grabbing the media spotlight, and hammering home his message. Gillard’s backdown on Thomson and Slipper is the best thing to happen to him, and he will capitalise on that every moment he can, while continually pushing for more capitulation. At the same time, he can sideswipe Windsor and Oakeshott by implying in the national media that they’re not listening to their constituencies, who want the minority government gone. And of course, he doesn’t have to provide any evidence – with much of the media slavishly repeating his assertions as fact, and Gillard giving them legitimacy by backing down. And let’s no forget these standards Abbott sets for the government don’t apply to the Opposition in his eyes. Oh, no. Just take a look, and you decide how far the hypocrisy goes. Coalition front-bencher Sophie Mirabella is entangled in civil action at the moment connected with a probate case – but Abbott won’t ask her to step aside until it’s resolved. Senator Mary Jo Fisher was the subject of criminal proceedings, and stepped aside from her Senate Committee position while they were underway – but continued to be paid for that role, and was never called upon to resign altogether. The Coalition was happy to accept Peter Slipper’s vote when allegations were made against him in 2003, arguing that there were no charges against him – yet now says the government must not do the same with Thomson. On the subject of poaching Parliamentarians for political advantage – in 1996, Labor Senator Mal Colston left the ALP at the urging of the Coalition, who installed him (as a nominal Independent) as Deputy President of the Senate. A year later he was charged with defrauding the Commonwealth – yet continued to serve in the Senate right through the investigation period. And finally, Abbott’s declaration today that ‘I don’t do deals’, when asked why he didn’t approach Windsor and Oakeshott directly to gain their support for a no confidence motion – despite offering a swag of money (including no less than $1 billion for the Royal Hobart Hospital) to Andrew Wilkie for his vote to form government in 2010. And knowing all this, Gillard still backed down. It’s a monumental blunder, and Abbott is far too wily a political animal not to seize on that weakness. Any way you look at it, you can file this under ‘FUBAR’. At least we have a little absurdity to relieve the seemingly unending round of blunder, bluster, hypocrisy and posturing. Strangely, that comes in the form of mining magnate Clive Palmer. We’ve seen a lot of Palmer lately. He’s become a bit of a poster child for opposition to the mining tax and carbon price packages – and, apparently makes good television. He secured a guernsey on QandA to regale us all with his considered opinions on how the Greens were running the government and exporting all our jobs to China. He got the media running to Canberra for his announcement that the Greens were, in fact, funded by the CIA – then, when confronted by the ridiculousness of his own claim, grinned and claimed he’d done it deliberately to pull focus away from a government announcement. This is the man who wants to build Titanic II (thought apparently without the help of James Cameron); who thinks cutting off government subsidies to millionaires will jeopardise their children’s future (perhaps they’ll only have three cars and two homes); and who avowedly ‘loves to litigate’. He’s a long-time contributor to the Queensland Liberal National Party, a vocal opponent of anything that smacks of environmental responsibility and a staunch defender of the right to cut benefits to poor people while maintaining upper class welfare. And now he wants to go into politics. Specifically, he wants to run against Treasurer Wayne Swan in the seat of Lilley at the next federal election. He announced he would seek LNP pre-selection today against a backdrop emblazoned with the motto ‘Swan’s Song’ – not the clearest of messages, mind you. Palmer put his metaphorical hand on his heart and pledged to work to ‘grow the nation’s prosperity and lift standards in Parliament’. Of course, he doesn’t see why he should give up his business while he’s actually in Parliament. It’s ‘only a small family company’, after all. Uh, Mr Palmer? Have you ever heard of a little thing called ‘conflict of interest’? It’s when your private interests and investments clash directly with your duty as a Parliamentarian. You’re proposing to sit in Parliament as a member of a government that is pledged to repeal taxes and schemes that you’ve shouted far and wide will significantly disadvantage you – and yet you think you can continue to run your mining company at the same time? (Mind you, this isn’t the first time Palmer’s taken a run at federal politics. As far back as 1984, he stood for pre-selection in the LNP and was soundly defeated. Seriously, Mr Palmer, get a political strategist to go with that media advisor you so desperately need. Even Abbott isn’t comfortable with this – he repeatedly refused to endorse you today. Take a hint. Even before the sun’s set, this is the kind of day in politics we’ve got. And this is what’s taking up all the air in the media. ABCNews24 just announced their afternoon current affairs program would focus on Thomson and Palmer. Not a whiff about the NDIS. Really, it’s enough to make anyone interested in actually examining policy weep. Like I said, some days it doesn’t pay to get out of bed. We all know it’s coming. We all know it’s going to be ‘tough’ (to quote Prime Minister Julia Gillard, Treasurer Wayne Swan, Finance Minister Penny Wong and a host of others). Yes, Budget time looms again on the horizon – and it’s becoming a de facto election battleground. Already we’ve seen both the Government and the Opposition in a race to the bottom on welfare. Opposition Leader Tony Abbott delivers a new ‘plan’ or ‘package’ almost every day, which – in his own words – is designed to be ‘a test for government’. All up, it’s a rather ridiculous competition on which side can claim to be fiscally tougher, while challenging the other to fund various areas of Australian life. Most of this, of course, is simple posturing. We have no details. Oh, the occasional figure gets waved around in a vague manner, but that figure is so hung about with caveats and ‘I’m not playing a rule in, rule out game’ that frankly, it might as well have been pulled out of a hat. For all we know, that’s exactly what’s going on. None of this is new. It’s almost an article of faith that as Budget time approaches, this sort of dollar-based manoeuvring and points-scoring dominates the political discussion. But it is frustrating. Government money is public money, and our job is to wait and see what they want to do with it. Little wonder, then, that polls fluctuate wildly. With that in mind, it’s time for The Conscience Vote to put up another Open Thread, and here are some thoughts to kick that off. What do you want to see out of the Budget? The government’s promised to keep to its self-imposed schedule to bring Australia back into surplus. Given the terrible disasters that struck earlier this year, and the massive cleanup bill, should they consider moving that date back rather than cutting too deeply into public funds? Are there any areas that need more funds, not less? Are there any areas that are already overfunded, in your opinion – and what should the government do about that? Most of all – why do you think these things should happen? Go wild. Make a wish list. This isn’t about crunching the numbers – it’s about what you think Australia needs, right now, regardless of what either Gillard or Abbott say. This morning a boat from Indonesia, carrying perhaps 70 or 80 asylum seekers reportedly from Iraq and Iran, crashed into the cliffs near Flying Fish Cove on Christmas Island. At the time of writing, it’s not known how many have survived. Acting Prime Minister Wayne Swan confirmed ‘some rescues’ this afternoon, but the full extent of the tragedy is still unfolding. Footage and pictures from the are shows how the boat broke up in the heavy seas until only debris was left. Christmas Island residents, standing helplessly on the cliffs above, described how they tried to throw lifejackets to the people in the water, only to have them flung back by the high winds. One woman broke down as she told Sky News how she heard screaming, and saw babies children falling into the water. A man who went out on the rocks to try to pull people to safety said he could see people being flung against the rocks by the waves. The pictures don’t begin to encompass the horror that took place today – and it’s not over yet. Some critically injured people were airlifted to hospitals – but how many of those who survived lost loved ones? I can’t help but think of the SIEV X disaster, back in 2001. Around 146 children, 142 women and 65 men lost their lives when a dreadfully overcrowded boat sank in international waters. These people, like those in the current situation, were heading for Australia to seek asylum. Unlike today’s events, though, those deaths happened far away from any cameras. In fact, it was three days before Australia learned of a ‘certain maritime incident’. Their deaths became the subject of a Senate Select Committee enquiry. They also became political capital in a Federal election that delivered John Howard’s Coalition a decisive victory. The question inevitably arises: just how will this terrible incident be exploited? Swan stonewalled most media questions that dealt with the wider issue of asylum seeker policy. ‘The rescue is ongoing,’ he said, over and over. ‘The priority … is the rescue.’ Gillard, who was on leave, has cut short her holiday to return to Canberra. The Coalition’s current spokesperson on Immigration, Scott Morrison, was remarkably circumspect in his comments. He confined himself to saying only that ‘worst fears’ had been realised, in his media conference this afternoon. He also stressed repeatedly that now wasn’t the time to discuss policy. Deputy Opposition Leader Julie Bishop was likewise very careful to avoid making political comments. A generous interpretation of their behaviour would say that they are showing respect for the situation. A cynical one would point to how dangerous it is to politicise a tragedy before a decent interval has elapsed. For whatever reason, our politicians are currently keeping the focus firmly on the incident. Much of the media are likewise treading carefully. Comment on asylum seeker policy has been largely restricted to fairly neutral recaps of the history of asylum seeker landings in Australia. Would that columnists like Andrew Bolt could show a similar level of respect. This afternoon’s blog, entitled ‘Blood on their hands’ is a real piece of work. In Bolt’s mind, apparently, he was a voice crying in the wilderness for at least a year. ‘I told Julia people would die!’ is his refrain. 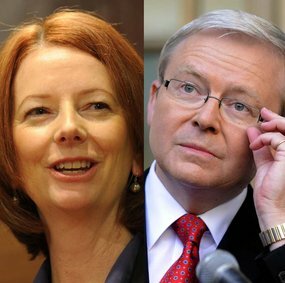 He points his journalistic finger, trembling with indignation, at the Labor government and commands Gillard to resign. After all, these people were ‘lured to their doom by her laws’. He also finds it necessary to point out that Gillard previously interrupted her holiday to appear with Oprah Winfrey in Melbourne. The implication is clear: she has time to deal with trivia, but it’s doubtful whether she’ll front up and take her lumps for this. Of course, he prefaces all these remarks with a handy-dandy little graph to show everyone just how terrible Labor’s asylum seeker policy really is – helpfully adorned with a big yellow dot to mark the point when former Prime Minister John Howard instituted the Pacific Solution. Just in case his readers didn’t realise that this was all about denouncing the Labor government. It’s disgusting. Actually, well beyond disgusting. This isn’t just politicising a tragedy – this is wallowing with morbid glee in death and trauma. Bolt’s one concession to the human beings at the centre of all this is to use the words ‘ghastly tragedy’. Everything else is schadenfreude and exploitation. Of course, Bolt isn’t the only one quick to shove their heads in front of a camera or a computer in order to join in the political fray. Jonathan Green at The Drum chronicled some of the rush to judgment by both bloggers and commenters. For once, our politicians are behaving better than those they represent. Sadly, it’s pretty much guaranteed that this won’t last. All too soon we’ll see the pollies going head to head. The Opposition will probably give us a softer version of Bolt’s rhetoric – and it’s perhaps a blessing that Parliament won’t sit again until February, so we won’t get the full-blown hyperbolic rantings that usually characterise this debate. The government will defend its policies, perhaps conceding to a Senate enquiry that is likely to conclude – as with SIEV X – that there was little Australia could have done to save this latest boat. Of course, if the polls show the Opposition gaining traction, we might see new, ‘tougher’ policy – which would undoubtedly bring the Greens and the Independents into the arena. All of that is inevitable. As much as we’d like to wish otherwise – that the debate can be sane, rational and above all compassionate – there’s little chance we’ll get more than each party’s message. If we’re very lucky, we might hear Andrew Wilkie deliver a stinging rebuke to both major parties – not that they’ll be listening. We can shrug and say that’s the nature of politics. And in a way, it is. But it’s my hope – and, I believe, the hope of many Australians – that politicians would keep at the forefront of their minds the fact that many, many people died today in terrifying circumstances. That they listen to the stories of the survivors, and those who risked their own lives to save them. That they know the names of the dead and never forget them. And above all, that they realise that they have no right – none – to exploit their deaths to make a political point. Are you listening, Andrew Bolt? The 2010 election is a leaky boat, and we’re the poor bastards bailing frantically, trying to make it to the other side of August 21. We’re eight days out from that shore, and – if anything – the waters are just getting murkier. This week it’s been all about numbers. The Coalition says Labor’s broadband can’t possibly be as fast as announced (1 Gigabit/second). Labor says the Coalition has ‘black holes’ in its budget, meaning that they can’t fund what they’re promised. Debt is huge. Debt is only 6% of our Gross Domestic Product. We wasted money on Building the Education Revolution. The BER was, on the whole, efficient. So it goes. For the record? A broadband speed of 1 Gbit/sec is achievable using optical fibre – in fact, there had been speculation in the tech sector as to why Labor was ‘only’ promising 100Mbits/sec. Our debt is 6% of GDP – the equivalent of $6000 interest on a $100,000 debt. (And given I just paid off a $20,000 loan that slugged me around $3500, that’s pretty damn impressive.) The Orgill Report into the BER has identified some cost blow-outs, but concluded that it was an efficient program. There’s an excellent post on The Notion Factory going into the details. This is fairly standard argy-bargy for any election campaign. It’s in each party’s best interests to make their opponent look as inept as possible. No surprises there. Labor has also been pressuring the Coalition to submit their costing proposals to the Charter of Budget Honesty in Treasury. This was set up by the former Coalition government, with the aim of informing the public whether those promises can be kept. So far, neither party has submitted their full list of costings. The Coalition is lagging far behind, though, and there are serious questions as to whether they have counted slashing proposed – not currently funded – Labor programs in their savings. Labor’s moral ground isn’t exactly high on this. During the 2007 election, they submitted their costings less than 24 hours before the election. Treasury had no chance to scrutinise the proposals. As such, the Coalition has been comfortable in saying that they’d ‘get their costings in’ before the deadline (this afternoon), and reminding everyone what Labor did last time around. Time was clearly ticking, though, and Joe Hockey was pressured into giving a commitment on The 7.30 Report that the proposals would be submitted. But then there was a new development. Early in the week, the Sydney Morning Herald published a ‘leaked’ document showing that there was a shortfall of $840 million in the Coalition’s costings. Yes, another leak. That brings us up to an average of one per week of the campaign. Predictably, Swan jumped all over it – here was proof of what he’d been saying all along. The howls of outrage from Joe Hockey and Liberal Finance spokesperson Andrew Robb were likewise unsurprising. It was sabotage, it was Swan, we can’t trust Treasury. Hockey even went so far as to accuse Swan directly in that same 7.30 Report interview. It’s worth mentioning that the document in question was dated July 5 – 12 days before the election was announced – and had been publicly available for some time. Now here we are on Friday morning, and the Coalition have said flatly that they will not submit any more costings to Treasury until the Australian Federal Police have investigated the source of the leak. Andrew Robb was doing the rounds of the media, proclaiming that ‘It could mean that they (Labor) steal an election through the actions of a criminal act. We are not going to be patsies and be played off a break by people who are engaged in criminal activities to create a political problem for us”. Instead, they will submit their costings – on Wednesday next week – to an as-yet unnamed ‘independent third party’. See what they’re doing here? The Coalition are playing the role of ‘victim’ to the hilt. This is ‘clearly’ a Labor plot to smear them. But who really benefits from the leak? Sure, Labor gets to point to this document and say, ‘Look, we were right all along’. They can hold up the Treasury analysis as proof that the Coalition has badly mismanaged their costings. But the Coalition gets a lot out of this, too. They can point the finger at Labor and shout, ‘J’accuse!’, branding them outright criminals. They can recapture the underdog status that they’d lost when their polling numbers went up – after all, they’re in an impossible situation. They can obscure the $840 million shortfall with outrage. Most usefully, they now have an excuse not to submit their costings – they ‘can’t trust Treasury’. The third-party analysts won’t get to see the costings until Wednesday, which is simply not enough time to scrutinise them properly. Finally, the whole point of the Budget of Charter Honesty is to ensure that costings can be checked against real figures – and there’s no guarantee this third party will have access to Treasury’s numbers. On the face of it, I’d have to say the Coalition benefits more from this leak. The fact that it came at a time when their broadband plan was shown up as vastly inferior to Labor’s is probably no coincidence. The Labor Party has no excuse for not submitting its costings to Treasury in a timely fashion in 2007. It was underhanded. Equally, the Coalition has no excuse for playing the same game. Its claims that Treasury cannot be trusted are completely disingenuous – anyone remember Godwin Grech and ‘Utegate’? That was a confirmed leak from Treasury, but there were no calls for a massive AFP investigation from the Coalition then, no claims that Treasury was hopelessly compromised. And no wonder – the Coalition was caught out, clearly benefiting from Grech’s behaviour. We had a low-key Senate inquiry into ‘Utegate’ that fizzled into nothing. Grech lost his job, but walked away scot-free. This time, though, the howls are loud and the banners being waved high. There is little chance of an AFP investigation into the ‘$840 million’ leak, and the Coalition has to know that. From their perspective, it’s a win-win situation. Either there’s no investigation, and they get to send their costings to a hand-picked accounting firm at the last moment – or there is an investigation, and the remainder of the campaign will get overshadowed by the spectre of a corrupt Treasury. And you can just bet that Robb, Hockey and Abbott will be out there making careful statements about what a terrible thing this is, and how under Howard this never could have happened. Even if it comes out that the leak came from the Coalition itself, by that time the election will be over. If the Coalition is in power a junior staffer will be sacked, there’ll be a couple of tough interviews with Kerry O’Brien and Laurie Oakes, and that will be it. If they lose – well, they’d be the Opposition, and Oppositions tend to get away with more than governments. It’d be good for a few sledges in Question Time, but that’s all. The real damage here is to the reputation of Treasury, and to our access to the inner workings of the political process. The Coalition can use this to keep casting doubt on everything Labor does. Meanwhile, we’ll be out in the cold with no idea whether either party can do what they promised. If we believe Treasury’s corrupt, Labor’s figures come into question. If we believe Treasury, we won’t be able to look at the Coalition’s figures in time. Either way, we go to the polls in a state of utter confusion.